Kataifi is a popular Middle Eastern pastry made with a special form of shredded phyllo dough and has lots of delicious uses. Kataifi looks like angel hair pasta (only more papery) and can be used to create a variety of savoury dishes and desserts (typically with nuts and syrup). Why not try a creamy cheese pie with a combination of cheeses and kataifi pastry instead of making the traditional Greek feta cheese pie with phyllo pastry? Either choice is great! Combine in a bowl the melted butter and olive oil. Grease a medium pyrex glass or other baking dish and set it aside to untangle the shredded phyllo dough. Work the kataifi dough with your hands, tearing apart the shreds and gently spreading the strands out a bit if they clump together, in order to make it fluffy. Divide it in two parts, spread evenly the first part of the shredded phyllo dough in the baking dish and brush it with half of the butter-oil mixture. Add the cheese filling and spread evenly with a spatoula or the back of a spoon. Layer the remaining kataifi dough on top and brush again with the remaining butter-oil mixture. Beat preferably with a hand mixer (or whisk by hand), the eggs and milk and pour the mixture over the shredded phyllo dough making sure that it is evenly soaked. Cover with plastic wrap and set aside in the fridge for 1-2 hours for the kataifi dough to soak up the egg mixture. Bake in 190°C (upper and lower heating) for about 60’ and convert to lower heat for the last 10’ to get it crispy underneath. When done, the cheese pie kataifi dough has to be golden and crispy both at top and bottom. Serve 20’ after baking. 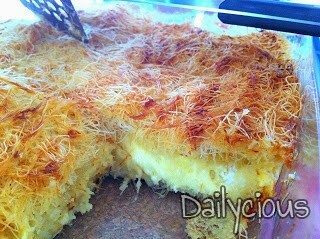 Next day, in order to get its freshness and crispiness again, cheese pie kataifi needs to be reheated either in a sandwich toaster or in the oven (120°C for 20’). “Kali orexi” as we say in greek or otherwise, enjoy your meal!